When there are millions of recipes available on the Net why must one attend a masterclass? Well, I personally like the additional tips that one gets while seeing chefs in action. So in addition to the recipes that one learns various kitchen hacks, tips and tricks improve one’s kitchen skills overall. 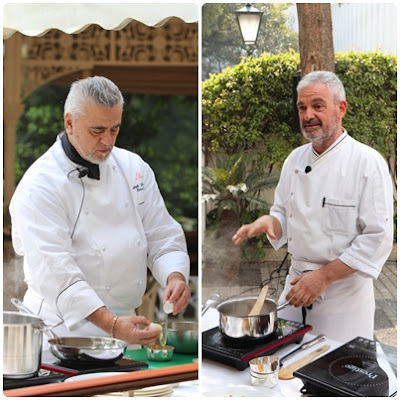 A fine Italian restaurant, San Gimignano at The Imperial recently hosted a wonderful masterclass with two charming chefs from Italy - Executive Chef Attilio Di Fabrizio from Belmond Villa San Michele, Florence and Executive Chef Roberto Gatto from Belmond Hotel Cipriani. They showcased some classic Italian dishes like gnocchi, risotto and the tiramisu. The recipes were simple and very easy to replicate at home. Before I share the recipes with you, I am listing some tips to get the maximum flavour from some of the most basic ingredients. - Garlic: If you don’t like the garlic to be too pungent, you may remove the little shoot that sits at the center of each clove. This is particularly useful if you are using raw garlic in salads, etc. Adding a dash of water while sautéing garlic stops it from over cooking. - Tomatoes: Add a dash of water and mash the tomatoes lightly to release the juicy flavour. Even while using cherry tomatoes, while you may want to retain the shape, a light mash will just help to cook them perfectly. - White Wine: Always try to use dry white wine else it may become too acidic while cooking. 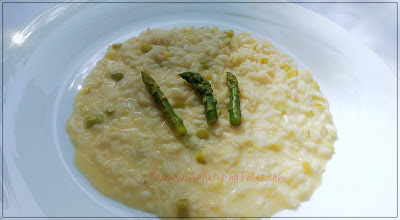 - Arborio or Carnaroli Rice: Rice ages too! Older rice may require more time to cook. Additional tip: toast the rice before adding wine/stock. Asparagus: While using asparagus (or any other vegetable) in pasta, it’s a good idea to saute it in butter, salt and pepper before adding it to the pasta to be cooked further. 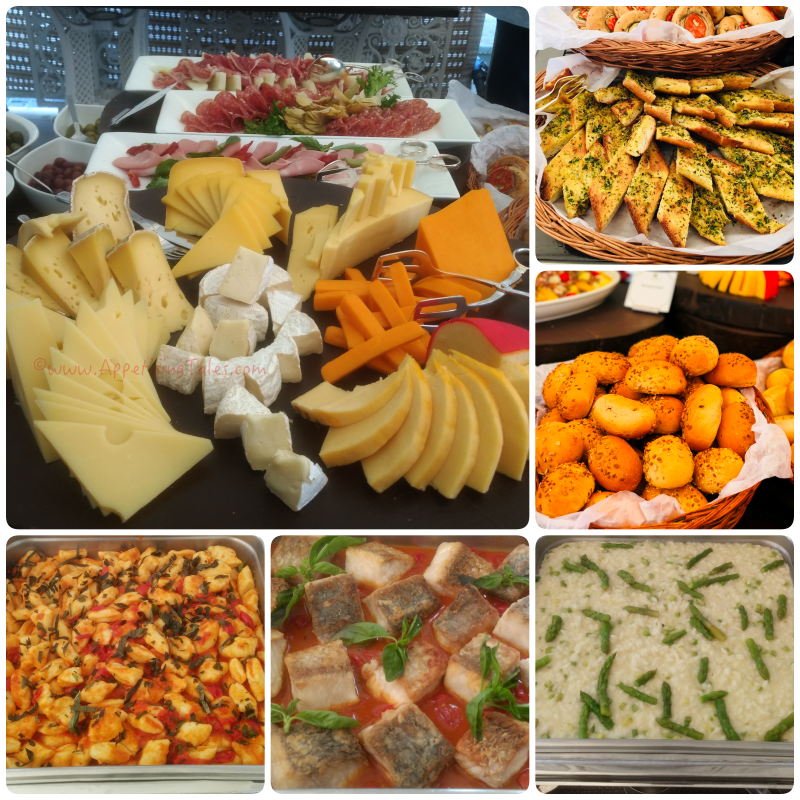 The delicious spread at San Gimignano. Our masterclass was followed by a delicious lunch. You too can taste these dishes and many more as the visiting chefs will be cooking up a storm at San Gimignano until 11th February 2018. And as part of this very first exchange with Belmond Hotels, Executive Chef Prem K Pogakula of The Imperial will also be travelling to Italy later this year to showcase the nuances of Indian cooking to an Italian audience. The Italian Chefs with Executive Chef Prem K Pogakula of The Imperial. San Gimignano, The Imperial, Janpath, New Delhi-110001. 1) Wash medium sized potatoes, put them in a pot with cold, salted water, cover and bring to a boil. Let them cook for approximately 20 minutes. To test the potatoes, pierce them with a fork and if the potato slides away, it is ready but if it remains on the fork, it needs to cook a few more minutes. 2) Once cooked, drain the potatoes, let them cool for a few minutes, then peel them and purée them with a potato masher or a vegetable mill. On your table top, (using wood if at all possible), form a fountain shape with the potatoes and add flour, salt, eggs and nutmeg, mixing the ingredients until you have obtained a smooth dough. 3) Heat 4 litres of salted water in a pot and bring to a boil when the dumplings are ready. 1.5 cm thick. Cut these cylinders into pieces about 2.5 cm long and roll them ith your thumb along the tips of a fork, one at a time. Place them on a tray lightly dusted with flour. 5) Wash the ripe tomatoes and remove the seeds and central core. Cut each tomato into 8 or 9 smaller pieces and set aside. In a steel pan 35 cm in diametre, lightly brown the chopped garlic in olive oil and then add the tomatoes. Cook for about 5-6 minutes or until they have absorbed their own water and add salt to taste. 6) Lightly toss the dumplings into the boiling water and once the water starts to boil again, let them cook for 3-4 minutes. 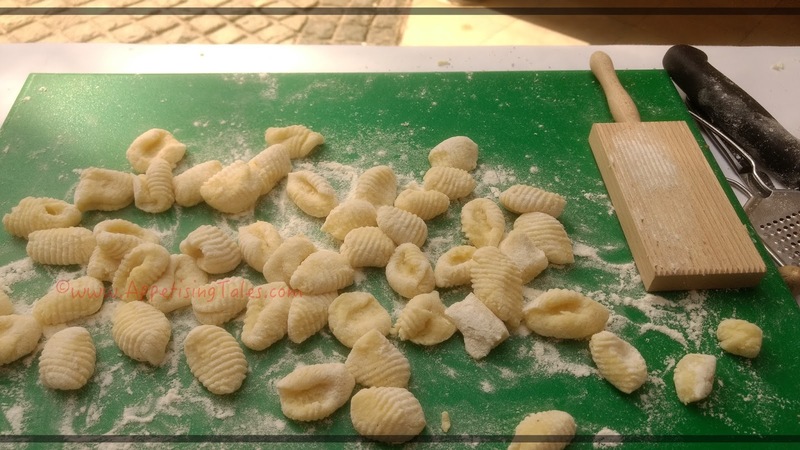 Remove the dumplings with a long handled colander or a slotted spoon. Add them to the pan containing the sauce and let flavour for a couple of minutes. Add salt to taste and add the basil leaves cut into julienne strips. 1) Melt butter in a frying pan and add onions. Cook for 2-3 minutes and add rice. 2) Toast for 2-3 minutes. Add white wine and cook until evaporated. Slowly add vegetable broth. 3) Add asparagus, previously cut and slightly cooked in butter, salt and pepper. Cook for another 15-16 minutes. 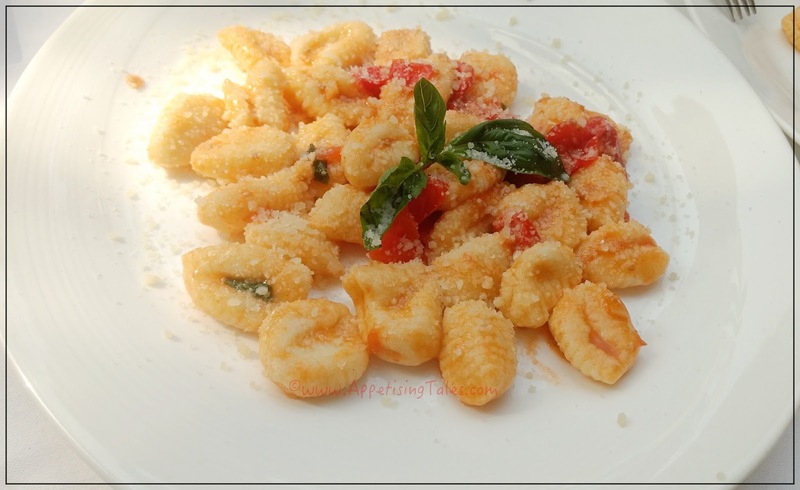 4) Remove from heat and amalgamate parmigiana cheese adding salt and pepper to taste. Drizzle olive oil and serve. Note: While Chef Roberto showed us how to make a delicious asparagus risotto, one can easily substitute the green asparagus with white asparagus or any vegetable of your choice. Of course, sticking to local, seasonal vegetables will enhance the flavour. I would recommend trying mushroom, peas, or even chicken or shrimp.